Wow – that title is quite a mouthful, but I really couldn’t think of a better one to go along with today’s post! A huge part of the makeover of our dining room was making the decision as to whether or not to paint my traditional wood furniture. I was plain scared, y’all. 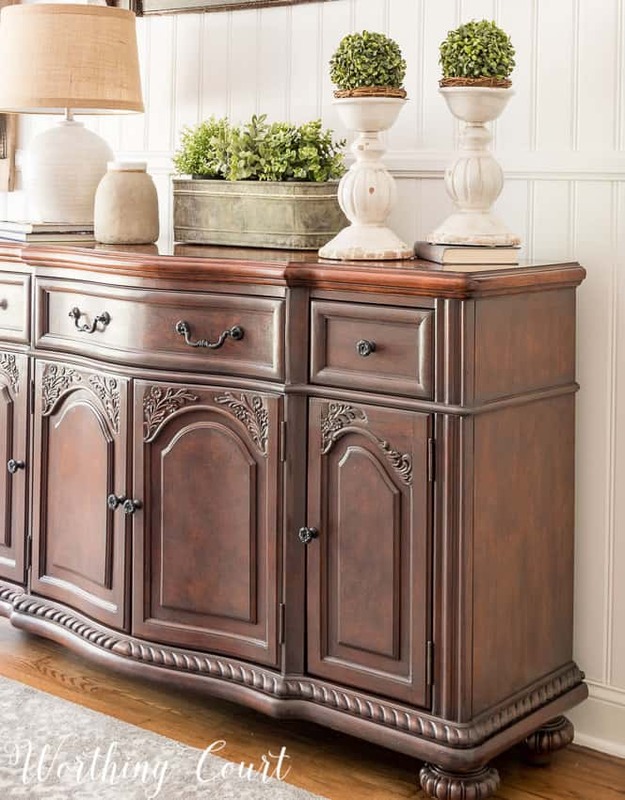 Even though the furniture is not a valuable antique, it was moderately priced at the time that we purchased it – so I knew that if I messed up and made the wrong decision I was going to have to live with it. There would be no replacing it. Yikes! Well…I took the plunge and am so glad that I did! It turned out to be the best thing that I could have done for our dining room! I didn’t just grab a can of paint and start painting though. There are a couple of tricks that I used to get a cohesive look – without being matchy-matchy. For this week’s edition of The Best Of Worthing Court, let’s take a look a the surprising techniques that I used. 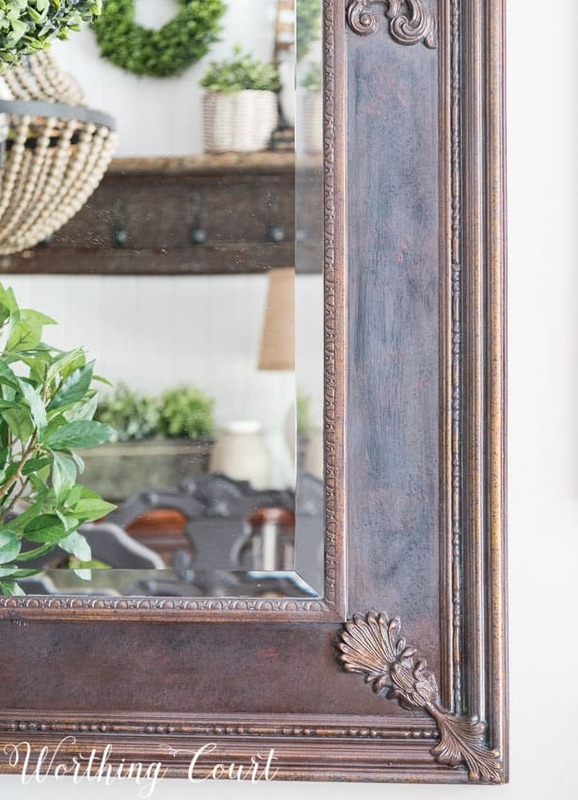 At the beginning of this makeover, I had no intention of painting any of my furniture, other than possibly painting the small cherry chest that was located under the mirror. I agonized over that little chest. Then, I remembered that I already had a gray chest in my foyer. After moving it into my dining room and changing the hardware, I knew that I couldn’t stop there and wound up painting almost every piece of furniture in here. Ha! 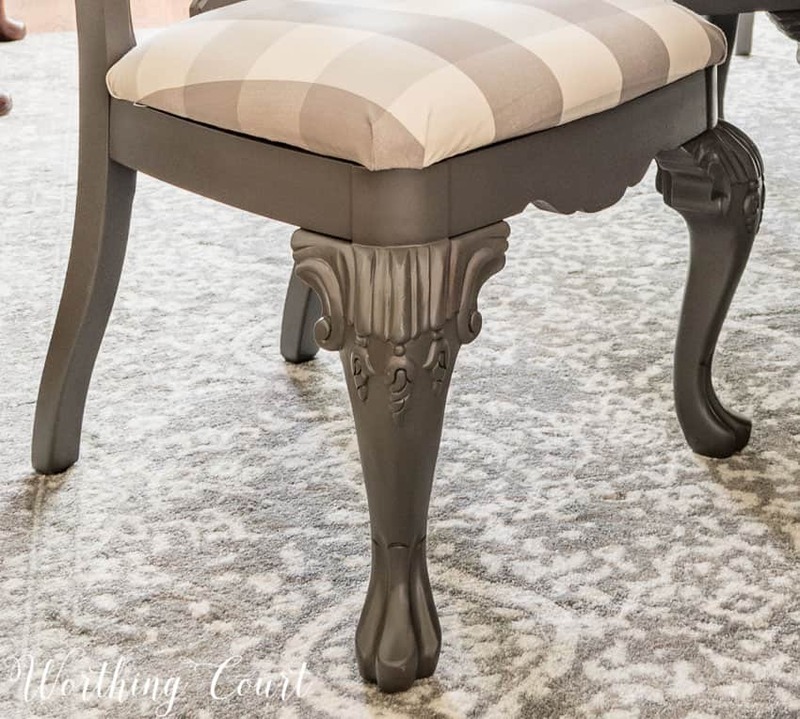 If you’ve been following the makeover progress, then you’ll notice that the chair beside the chest is different than what originally resided here. When Pookie asked me what I wanted for my birthday, I immediately said, “Recover the old office chairs!”. And so we did. Happy birthday to me. 😀 Click HERE to see the original chairs. I found the awesome buffalo check fabric at Printer’s Alley, which is a local fabric shop. Once I brought the gray chest into the dining room, the sea of brown furniture bothered me even more. So…that little chest and the fabric that I recovered the chairs and chair cushions with was just the nudge that I needed to force myself to overcome my fear of painting the rest of the furniture. 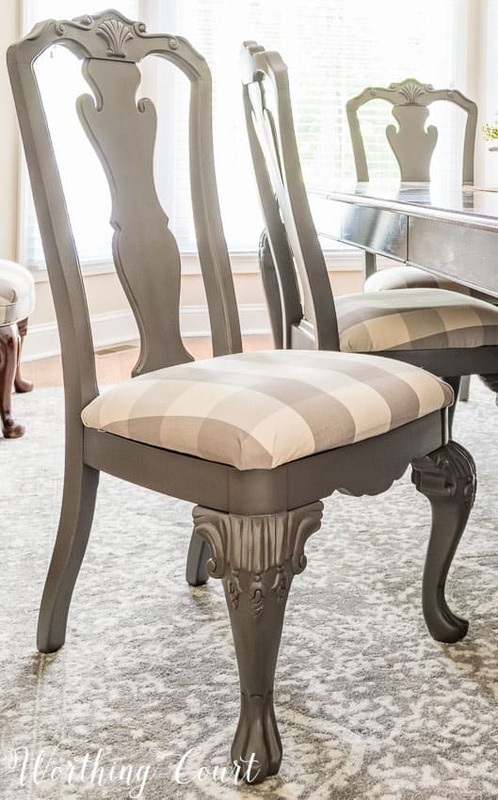 The brown chairs just didn’t look that great with the gray and white fabric. Spray paint to the rescue! If you’ve been following me for long at all, you already know that I’m a totally lazy and messy painter and love it whenever I can use spray paint. I have a go-to gray spray paint color that I almost always use – Rustoleum Anodized Bronze. It’s a rich gray color that isn’t cold, like some grays can be. Each chair used two cans of paint (three coats) to completely cover the brown. Even though it appears that I added a dark glaze over the paint, I didn’t. This is just the spray paint and nothing else. Of course, one thing leads to another. Right? After the chairs were painted, it became obvious that I needed to do something with the table. Sooo….I painted the legs of the table to match the chairs. BUT – there was no way that I was going to haul that heavy table outside so that I could spray paint it though. But that meant that I needed regular paint to match the spray paint – right? My solution was to spray a solid coat of the spray paint onto a scrap of wood and took it to my local paint store to get them to color match it for me and it was perfect!. All I had to do was to put a dropcloth under the table and spend an afternoon with my trusty paint brush. I opted not to paint the top of the table for two reasons – 1) I knew it would get scuffed up with use and 2) I actually like the look of brown wood mixed with painted wood. That left one more large piece of furniture that I truly never ever thought I would paint – the sideboard. But, guess what? It stood out like a sore thumb once the gray chest was brought in and the table legs and chairs were painted. 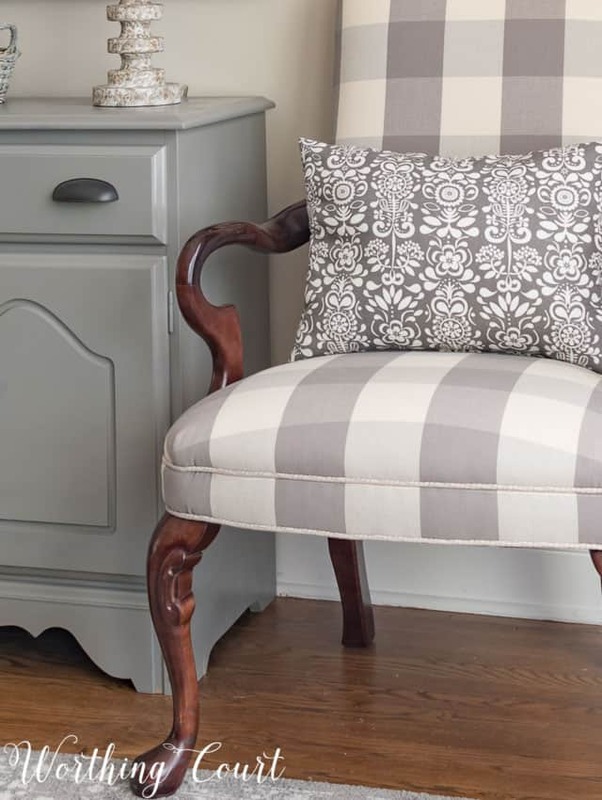 However, I felt that having another solid gray piece of furniture in the room would be too matchy-matchy, so I gave it a gray-wash with the gray paint that the paint store had mixed for me. I used 1 cup of the gray paint mixed with 1/2 cup of water and applied it with a paint brush. I dabbed more paint on where needed and used a rag to wipe places off that had too much, until I got the look that I was after. Just like on the table, I opted not to paint the top of the sideboard. At certain times of the day, the gray-wash is very subtle (like in this photo), but at other times it’s more pronounced. I kept the same hardware, but removed the backer plates to some of the knobs and painted the remaining hardware with matte black spray paint. That left one last decision to be made. What to do with the mirror above the chest. Replace it with a chalkboard? Keep it? Paint it? In the end, I decided to keep the mirror as it helps to bounce light around in this often dark room. I didn’t mind the black frame, but did not like the garish gold accents. Once again, I didn’t want to paint the whole frame a solid color, so I played around a bit with a couple of different stains. I first applied a coat of Minwax Special Walnut and before it was dry, I added a coat of Minwax Classic Gray. I used the same dabbing on and wiping off technique that I used on the sideboard until I got it just right. You can see that the stain still allows the black part of the frame to show through, but dramatically tones down the gold. It’s a good technique to use if you don’t want solid coverage. In spite of my fear of painting my “nice” dining room furniture, I’m beyond happy that I did. Thank you to my daughter and to a sweet blogging friend who strongly encouraged me to go for it. I finally came to the realization that I would never be happy with my furniture as it was, no matter what else I did in the room. So, if you’re hesitant to paint any of your furniture, start out with something small and take it one step at a time. 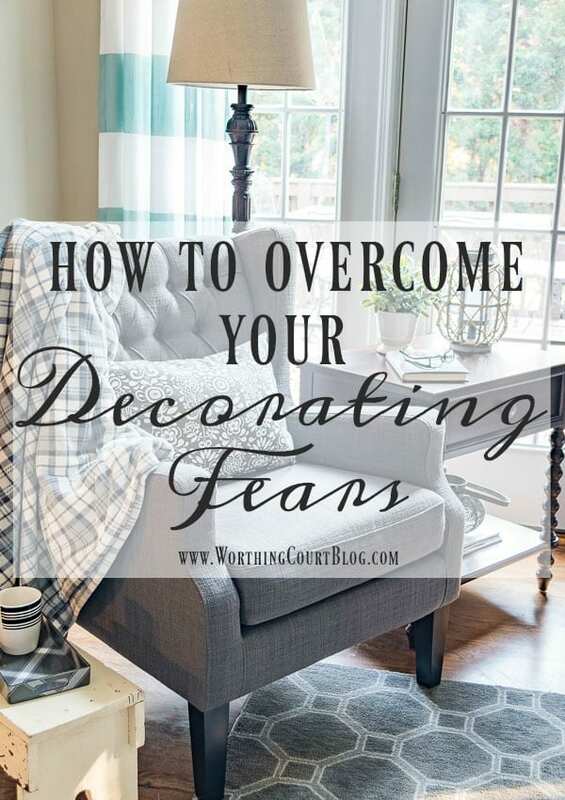 Need a little more help with overcoming your decorating fears? You might find this helpful! Your blog has made Anodized Bronze my new favorite color! I love the way your furniture came out, it’s gorgeous! I’ve been agonizing over painting my bedroom furniture but haven’t found the guts to do it yet. 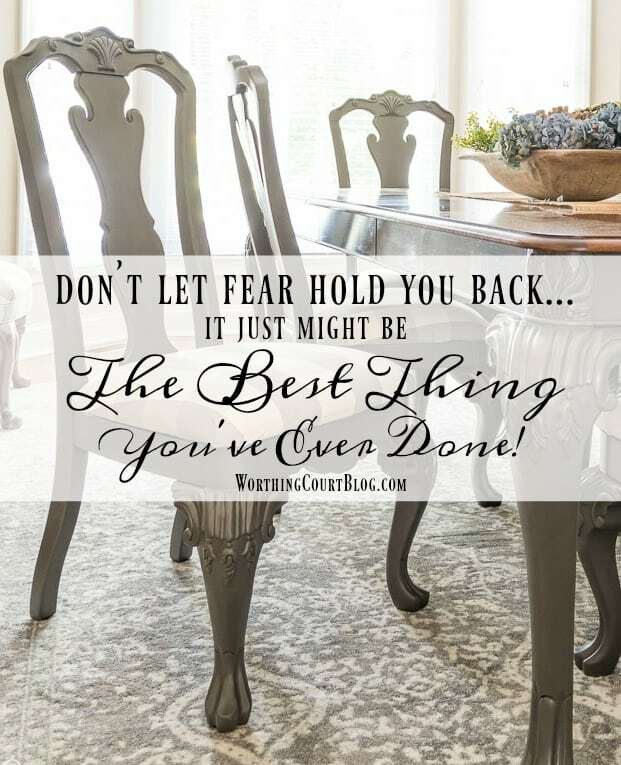 Thanks for this post – so inspiring – now to paint some furniture!! I am going to use the Anodized Bronze for my daughter’s table and chairs. I can’t wait to see it when it’s finished! It looks beautiful your brave. You are so so brave to paint such beautiful furniture. I have to admit it is absolutely gorgeous now. I have had thoughts of painting the chairs and table (except for the top) of our kitchen set. Hubby says the oak is beautiful as is. He usually doesn’t stop me from any decorating projects but painting oak is one of them. Love, love, love your dining room makeover! You turned the room from a tired traditional look to one of warm sophistication. Wish I had your nerve to take on my kichen table & chairs. It would take quite a bit of convincing of hubby who bought the set for us. I, too, have cherry dining room furniture that was expensive to purchase back in the day — I guess that’s why my fear of ever painting it keeps it just as is. After reading how you took the plunge, however, I may just attempt to paint it (someday). In the meantime, though, I’m more than ready to paint my cherry bedroom furniture! It needs a pick-me-up and I just love the Anodized Bronze result — it is the way to go! Your furniture looks great! So no worries about having to live with it, though I do understand the fear. I love this room! I am now wandering around my house with a more critical eye. Thank you for inspiring me. 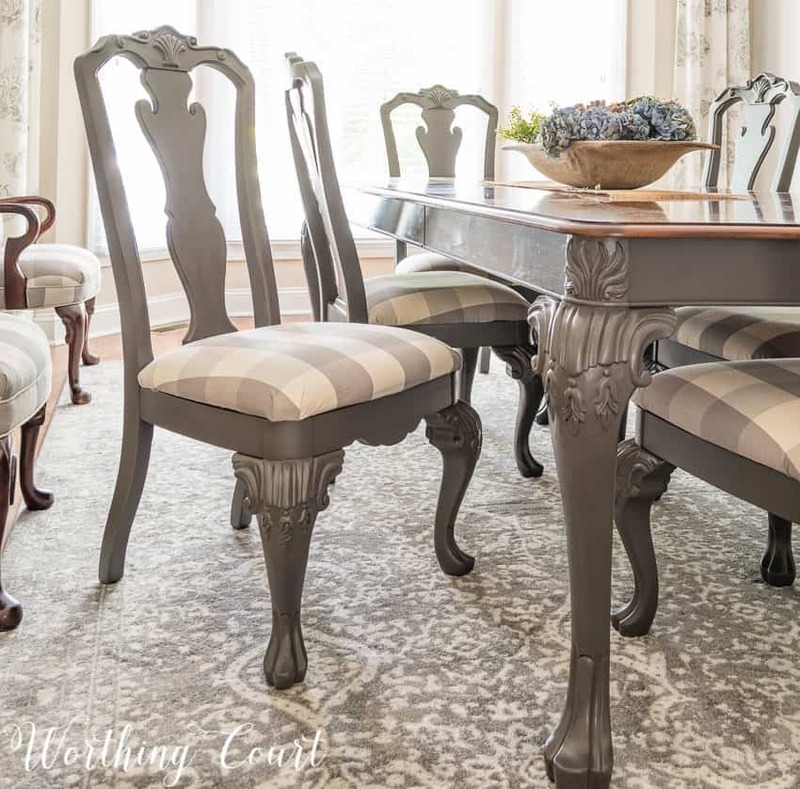 Love the paint color, fabric and rug you used in your dining room. Thanks for sharing! I have a 13ft entertainment center that I’m trying to find the courage to paint. I have even bought the paint. Applying that first brush stroke is scary. Thanks for the encouragement! I love your dining room and what you’ve done with painting the furniture. I love the results! I did something similar in my dining room. I painted my hutch which led to painting my table/chairs. I had to add a gray wash to the newly stained tabletop to make the room look cohesive. Distressing the chairs and table legs after I spent so much time making them look “perfect” was a hard decision but it turned out to be just what they needed. Astonishingly beautiful, Suzy. Our gamble with off-white chalk paint has been going on since mid-January (I’m disabled due to brain injury.) It’s inspiring to look back at your gorgeous outcome. I would NEVER have thought of putting a metallic paint on wood! Pure genius! Yes! I love this paint! After inspiration from you, I painted my kitchen table and chairs with this paint and LOVE the results! I’m going to paint my favorite little side table . You gave me the courage to go for it. I’m so impressed, Suzy. Didn’t realize that you had done ALL the painting and refinishing to all of the pieces. I LOVE your go-to-gray paint color… and you really did make it look different with the techniques you used, yet it’s very cohesive! Your hard work definitely paid off. The room looks amazing! I love spray painting things to give them a new look but never thought to spray painting furniture. It is all so gorgeous! Love it all. I have a few not so valuable pieces of furniture that you have given me the idea to paint. Never thought of using spray paint. Definitely going to give it a try. Thanks for the encouragement. thanks for the encouragement! It looks wonderful and now I am painting a mahogany china cabinet that has needed it for years…. Where did you get the chunky two whitewashed candlesticks? They are the ones sitting with the small cachepot from pottery barn on a basket tray in your spring tablescape picture. Thanks so much! Love all your ideas! I love the finished result of your dining room! Suzy, love, love, love what you did! This has inspired me to paint my oak kitchen table. Did you need to sand or prep before spray painting? How many layers of paint did you use to achieve that look. Thanks for all your posts! Hi Gina. The only prep that I did before painting was to thoroughly wipe down my furniture with either TSP or some variety of liquid sandpaper. I also explained to the folks at the paint store what I was using and used the variety of their paint that they recommended – one that has good bonding capability. I used two coats of paint all over everything and then touched up areas that needed it with a third coat. Hope this helps!